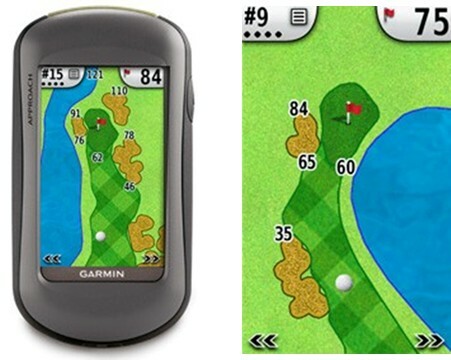 When I first read about the Garmin Approach G5 Golf GPS, I thought they had invented a new golf ball with a GPS transmitter built in so you would never loose your ball on the links again. Then I realized they would cost about $100 each, which would be a royal drag if you hit into a water hazard. Nope. The Approach G5 Golf GPS is essentially a hi-tech digital range finder which uses GPS to ascertain your position (after you’ve found your ball) and gives you range data to the pin based on preloaded maps of thousands of golf holes from all around the world. In addition to range data to the pin, it has a green view for up close putting data (again, a range finder) as well as being able to keep track of your score digitally. Duffers can then download and track their scores onto their PCs. The thing is though, even if the GPS range data gives golfers more accurate positioning in which to choose their irons, etc. For $500, it amounts to a sophisticated scorekeeping system. Sorry, but unless it can find my golf ball for me, it’s not really worth the price, I can add just fine.